UK house prices fell by by 1.4% in January compared with the previous month, government figures show. However, there were significant regional variations in the monthly data from the Department for Communities and Local Government (DCLG). In the East of England, prices rose by 2.8% but there was a 3.6% fall in property values in Yorkshire and the Humber, it said. Separate research shows that mortgage availability is still tight for some. 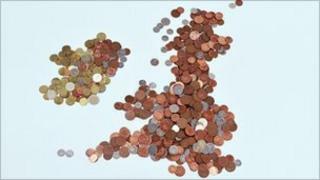 Average house prices across the UK dropped over the month, leaving the typical home costing £208,552, the DCLG said. This meant that prices over the year to January rose by 0.5%. In England, the price of the typical home rose by 1%, but it was down by 1.8% in Wales, down 3.2% in Scotland, and down 14.1% in Northern Ireland. "At best, the market will remain flat this year, at worst it is heading for further falls, especially in areas where unemployment is rising sharply," said Nicholas Ayre, a director of Home Fusion buying agents. "As ever, expect sharp variations from region to region. In the property market right now, the negatives far outweigh the positives and in some areas, especially those overly reliant on public sector jobs, there are very few positives at all." Properties bought by first-time buyers have been rising in price over the year to January, the DCLG said. However, figures from the Financial Services Authority (FSA) showed that those looking to get on the housing ladder still required a large deposit. The City watchdog said that only just over 2% of new mortgage lending in the final three months of 2010 was to those who could offer a deposit of less than 10% of a home's value. The number of homeowners getting into arrears on their mortgage payments for the first time was up 6% in the final three months of the year compared with the previous quarter at 38,800. However, the FSA said that the total number of arrears cases was the same in the final two quarters of the year, and was 7% lower than the final three months of 2009.